When you go to the doctor it is usually because you are concerned about some symptom or problem because it may mean danger to your health or because it is causing pain or because it is interfering with your ability to function at work or with family or friends. 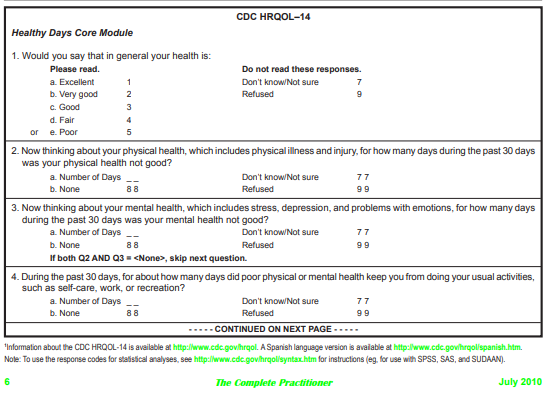 The CDC HRQOL-14 is a set of questions that provide a snapshot (a measurement) of how your health is affecting your ability to enjoy life and your ability to get things done. By filling it out every so often it can help you and your doctor see how you are doing overall—better, worse, or the same. 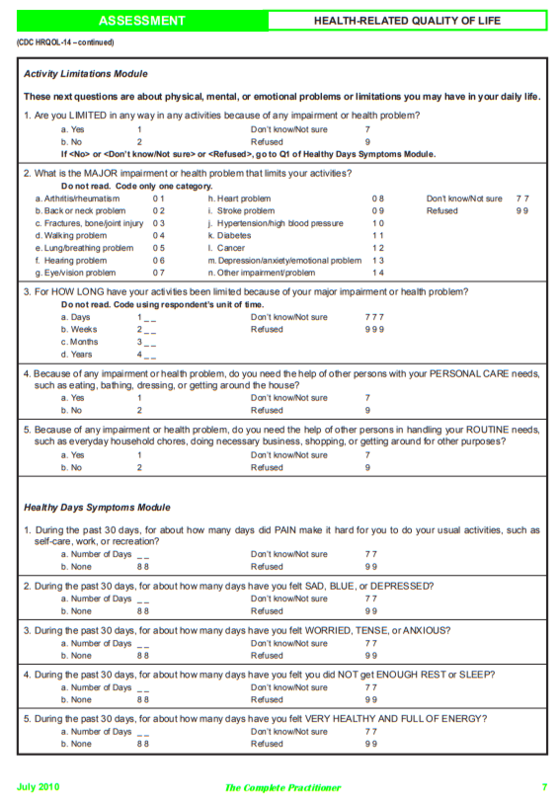 Here is a link to the CDC HRQOL-14 PDF that you can print out to follow your patients over time. 2. Now, thinking about your physical health, which includes illness and injury, for how many days over the past 30 days was your physical health not good? 3. Now, thinking about your mental health, which includes stress, depression, and problems with emotions, for how many days over the past 30 days was your mental health not good? 4. During the past 30 days, for about how many days, did poor physical or mental health, keep you from doing your usual activities, such as self-care, work, or recreation? If you circled yes to question 1, please answer questions 2 through 5 in this module and then proceed to the next module. 5. Because of any impairment or health problem, do you need the help of other persons in handling your ROUTINE needs, such as every day household chores, doing necessary business, shopping, or getting around for other purposes? 1. During the past 30 days, for about how many days did PAIN make it hard for you to do your usual activities such as self-care, work, or recreation? There are a number of different Health Related Quality of Life instruments. Certain diseases may best be followed by a specific HQROL instrument. 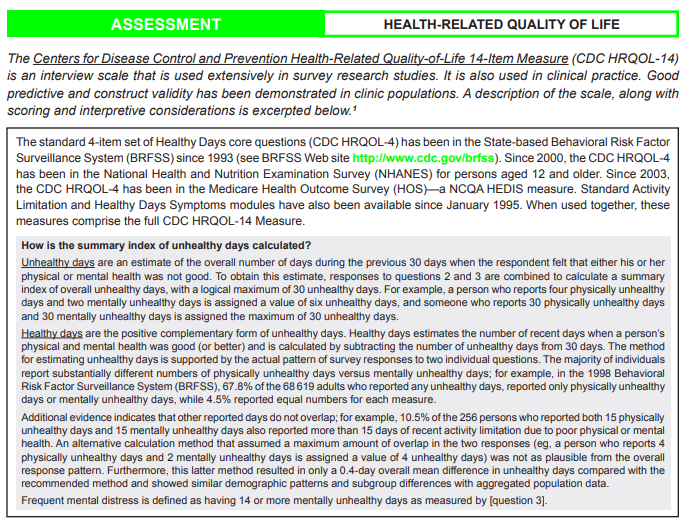 And the CDC HRQOL-14 was developed for public health measurement and not for clinical use. But it is in the public domain and so there is no charge for its use. Clinicians and patients can try it and see if it yields useful information for following patients overall health. This entry was posted in Geriatrics, Internal Medicine, Medical News, Medical Tests, Preventive Medicine and tagged health monitoring. Bookmark the permalink.